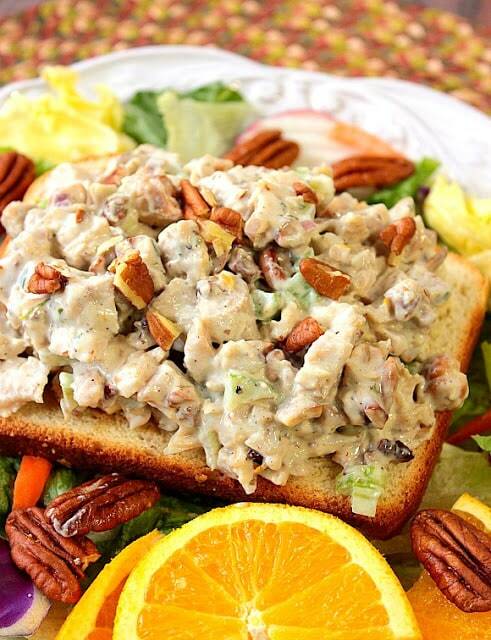 Creamy Crunchy Orange Cashew Chicken Salad uses poached chicken thighs, roasted cashews, and pecans, along with a touch of orange zest and juice. 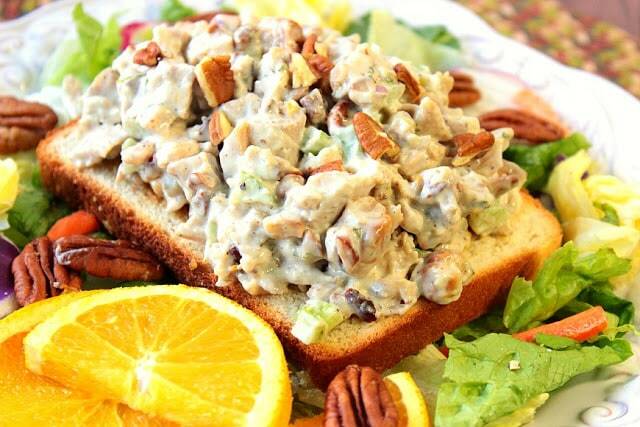 It’s simply the best chicken salad, ever! My recipe for Orange Cashew Chicken Salad was inspired by a cashew chicken salad I’d had recently while out to lunch with my mom, sister, sister-in-law, niece, and my baby grandniece, Pemberley. Believe it or not, it was our first “ladies lunch,” and I think we all ordered the same thing, except Pemberley of course. Sometimes there is nothing better than taking the afternoon off to be with friends and family doing girly things, like a ladies lunch. Since I work from home, I find that I occasionally have to force myself to leave the house to do things other than going to the grocery store. We spent this particular afternoon going to a pottery store, a flea market/craft show, and lunch. It was a wonderful way to reconnect and feed my soul, as well as my tummy. And as a much-needed reminder that there’s a whole world outside of my own four walls, and beyond the window of my computer screen. It doesn’t mean however that once I’m out and about that, I don’t think about, talk about, and dream about food. I always do, and I probably always will. The inspiration for new recipes is everywhere, and to me, that’s extremely exciting! To make my Orange Cashew Chicken Salad as flavorful as possible, I decided that I’d use nothing but the most tender and flavorful part of the chicken (in my opinion), the thighs. If you’ve never poached chicken, please don’t be intimidated by doing so. If you can boil water, you can poach chicken! Trust me! I also chose to pan roast raw cashews and pecans, because that’s what I had in my freezer. But all that said if you choose to make this Orange Cashew Chicken Salad using all white meat chicken breasts, or rotisserie chicken, or store-bought and roasted salted cashews and pecans…GO FOR IT! I’m not here to say that you have to follow my recipe to the letter. I’m just giving you an outline of a flavor profile that will knock your socks off. On a side note, if using store-bought salted and roasted nuts, I highly suggest you cut back on the amount of salt used when seasoning the chicken salad itself. Always taste before adding additional salt. (February 2018 update) NOTE – I’ve updated this recipe for Orange Cashew Chicken Salad since I first posted it back in 2015. The video below is the updated version and includes dried cranberries and omits the pecans which you’ll see in the photos. I’m including both recipe versions for you to enjoy. They’re both delicious options, and I know you’ll love either one! -If poaching the chicken breasts, place in a medium saucepan with the water and salt. Bring to a boil and allow the thighs to simmer for approximately 15 or until the chicken is cooked through and no longer pink. Drain and allow the thighs to cool. Once cool, cut the chicken into small 1″ pieces. -Meanwhile, if roasting your own nuts, place them in a small skillet with the oil, salt, and pepper. Saute over medium heat, stirring constantly for 3-5 minutes, making sure to watch them carefully so they do not burn. Remove from heat and allow to cool. -In a large bowl, stir together the cooked chicken, roasted nuts, shallot, celery, tarragon, orange zest and juice, mayonnaise, honey, and Dijon mustard. If needed, season with additional salt and pepper. -Cover and allow to chill in the fridge at least 1 hour for the flavors to develop and marry. -Serve as a sandwich or with your favorite salad. 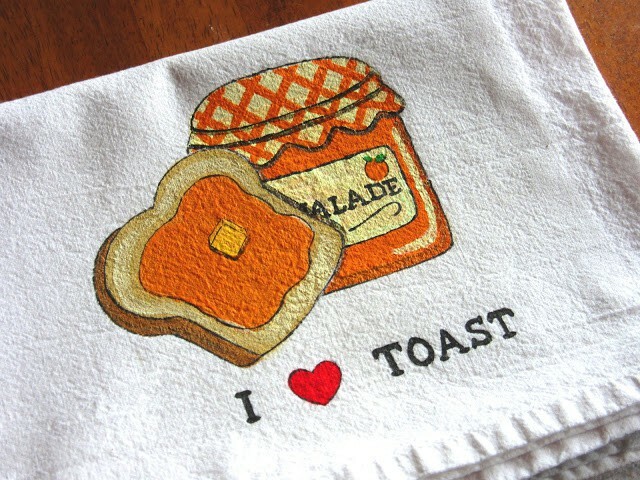 Perfect for ladies luncheons, showers or anytime you’re looking to wow your taste buds with something amazing! Cover and chill for at least 60 minutes before serving. Garnish with additional chopped cashews if desired. I think this recipe for Orange Cashew Chicken Salad coordinates perfectly with this hand towel that I painted, and which is available for purchase by contacting me directly. The towel was a special order design request and I love how it turned out so much. I hope you’ve enjoyed this recipe for Orange Cashew Chicken Salad as much as I’ve enjoyed bringing it to you. Should you have any questions regarding this recipe or anything else you see on my site, please don’t hesitate to contact me directly, or leave me a comment in the comment section below. It is always my distinct pleasure to get back to you with a reply just as soon as I possibly can! Yum! I love everything about this! How cute is the name Pemberley. And I totallly agree about the ladies' day out–totally a NEED now and then. You did a great job here. Sandwiches are my favorite thing and especially when there are nut in them. I'll have to try making this for my friends! It sounds delicious! This sounds amazing. Perfect for holiday brunch. Mmmm I am loving all of the different flavors and textures going on here. Looks so yummy! I LOVE this chicken salad! I'm not just saying I am going to try this I AM GOING TO TRY THIS! I think it would be great on top of a bed of greens! and yes, the best recipe inspiration comes from our favorite foodie places! Loooove all the flavors in this, YUMMY! The orange, tarragon and pecans are especially calling my name! Oh my goodness, I know what you mean, sometimes I have to force myself to just step outside; working from home can be tough like that! 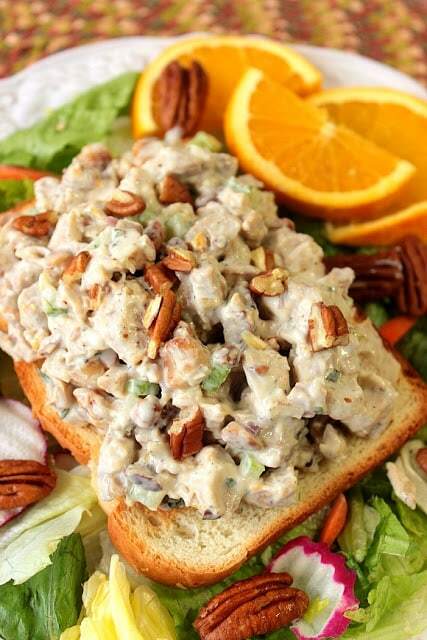 This chicken salad is a great reason to stay home, it looks so good! That's a super looking salad, and I LOVE tarragon, it goes so well with chicken! I love all of the flavors in this! I've been using shallots like they're going out of style lately, so I'm especially happy to see those in there. It's embarrassing how often I leave home for something other than grocery store (or doctor's appointments). It's so cozy here. And I can wear pajamas! That's so nice that you live near family. And this looks great! I just love this delicious twist on traditional chicken salad. 🙂 The addition of the cashews and orange sounds amazing! I'm with you, working from home tends to make some of us a bit reclusive. I forget there's real life out there. My only problem is I don't have any foodie friends locally so I never get to do foodie adventures. Usually I'm dragging my daughter with me on those. Luckily she digs it. I try to force myself to have lunch with a girlfriend or two at least once a month. That way I stay in touch with the real world a bit. Otherwise it's just me hanging around the house in my jammies 24/7. Ha. 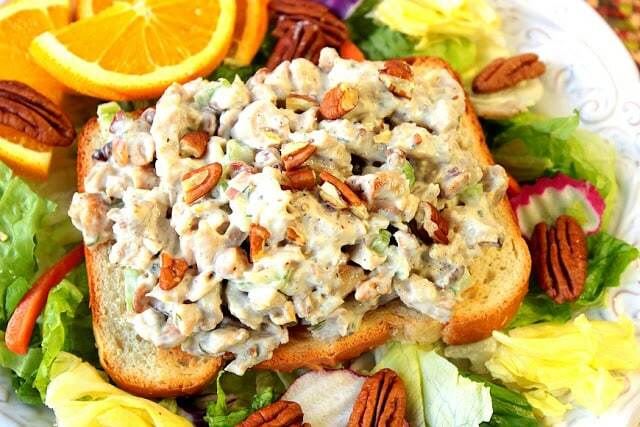 There is nothing quite like chicken salad. My mom used to love to make versions of it for lunch when my gramma and aunts visited. This one looks amazing. Deliciousness in every bite. Meeting friends for lunch is a necessary thing! Especially when you work from home and don't talk to anyone else all day. Love this chicken salad though, for days when I am home! This sounds fantastic! Love creative variations on chicken salad! I get most of my inspiration from eating out, too! Ladies lunch sound fabulous. What a nice little break from work!! 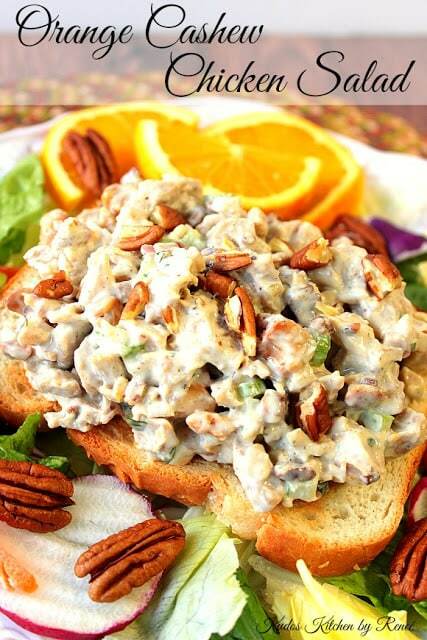 This orange cashew chicken salad is absolutely stunning! I love your presentation. Simply beautiful! I love the way you piled the salad on the bread! It certainly makes me want to get some! Chicken salad is my go-to "OMG I'm so hungry I need to make lunch now!" dish. I love the addition of orange and cashews. I normally add nuts but never thought of cashews! Yes! The thighs are the best part of the chicken! 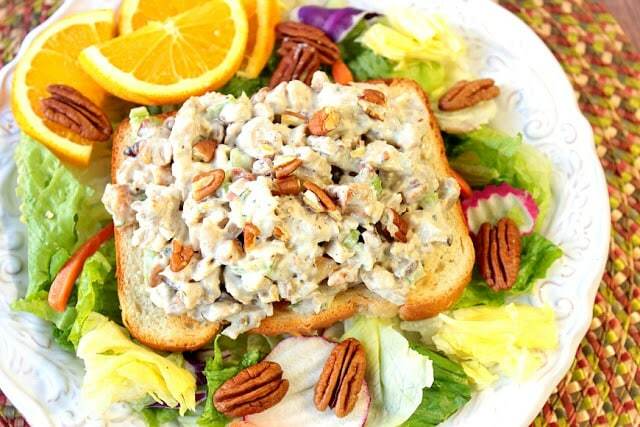 This looks fabulous – totally making it next time I get a chicken salad craving!